Wind and surf continue to pound Cape Cod Bay beaches, depositing cold-stunned sea turtles with each high tide in numbers beginning to presage a record stranding season. Turtle Journal’s Sue Wieber Nourse and Rufus chugged out to Brewster this morning and searched the shoreline east of Saints Landing. 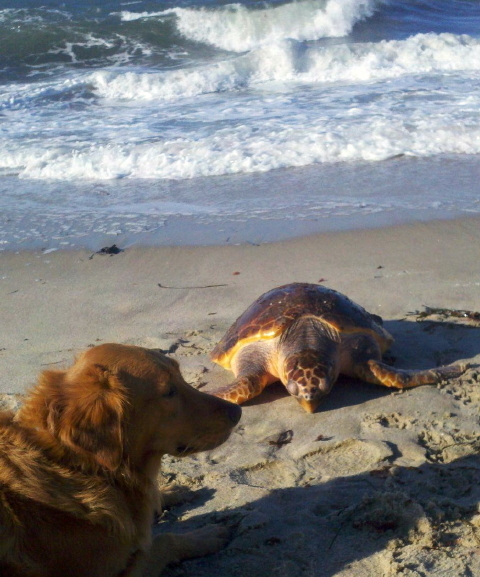 As they approached Breakwater, Rufus spotted a helpless sea turtle trapped in the forthy surf. Sue and Rufus plunged into the waves and lugged this young hybrid to safety … with Sue providing the muscle and Rufus barking encouragement. Out of danger from the surf, the juvenile sea turtle responded to Sue’s touch with positive signs of life. Clearly, an unusual specimen, Sue examined it carefully to determine its species. The massive neck musculature indicated loggerhead, but shell patterns and shape seemed to point to a green sea turtle. Later, at the Wellfleet Bay Wildlife Sanctuary, Director Bob Prescott and Sue settled on a preliminary identification of this sea turtle as a hybrid loggerhead-green. Bob took a tissue sample for DNA analysis. For rudimentary field measurement, Sue put her sneaker near the turtle’s carapace to get an approximate size; in this case, maybe around 14 inches straight-line length. 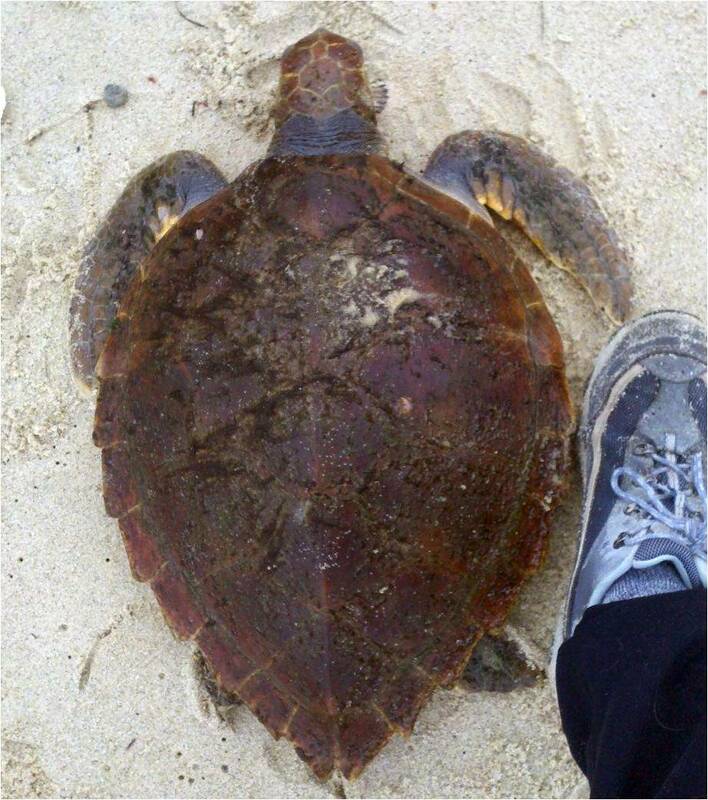 Yet, with its massive muscles, it weighed more than 15 pounds and took a yeoman’s effort for Sue to lug it nearly a mile from the beach to the Turtle Journal car. The juvenile hybrid will be transported to the New England Aquarium for treatment. Freezing and blustery … in other words, perfect conditions to rescue cold-stunned sea turtles in the Great White North. Sue Wieber Nourse and Rufus the Turtle Dog headed to Outer Cape Cod this morning, targeting Saints Landing in Brewster as the most likely spot to find a stranded sea turtle with frigid winds pounding out of the north-northwest. 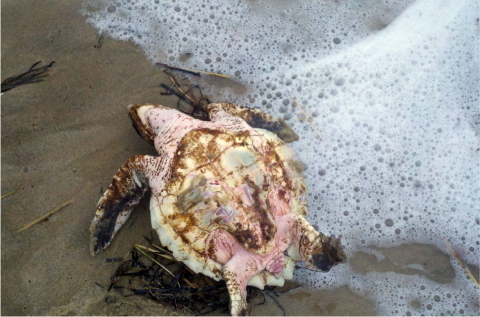 They headed east at Saints Landing and just before reaching the impassable, flooded area near Breakwater, Sue spotted the pinkish, white plastron of a Kemp’s ridley helpless and tossed upside down in the stormy surf. This 2-to-3 year old juvenile weighed about six pounds. Pinkish coloration confirms cold-stunning, as blood pools ventrally when the heart rate drops to only a couple of beats a minute. 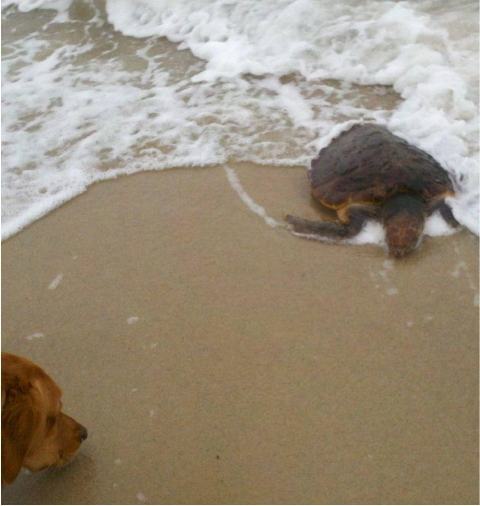 Once Sue recovered the turtle from the pounding surf, it quickly responded with lively movement, indicating an excellent candidate for rehabilitation and return to the wild. 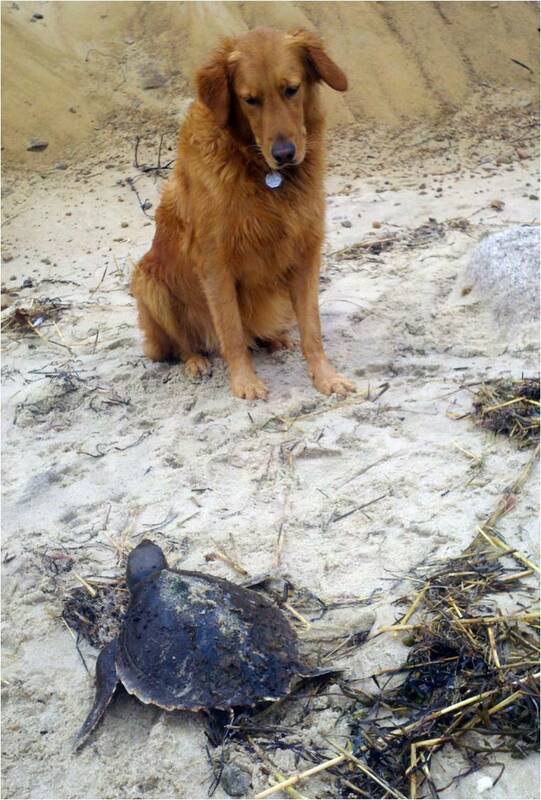 Rufus stood guard as Turtle Journal notified Mass Audubon’s Wellfleet Bay Wildlife Sanctuary that Sue would be bringing the turtle to Wellfleet for transport to the New England Aquarium. Kemp’s ridleys are one of the most endangered sea turtles in the world. As part of their natural life cycle they drift north as hatchlings from their natal sites in the Gulf of Mexico, catching a ride on sargasso mats in the Gulf Stream. Around age two or three, they leave the Gulf Stream and transition to a benthic habitat by swimming west to the coast. Those that hit the U.S. north of Massachusetts have to contend with the giant arm of Cape Cod as they begin to migrate south with dropping water temperatures. 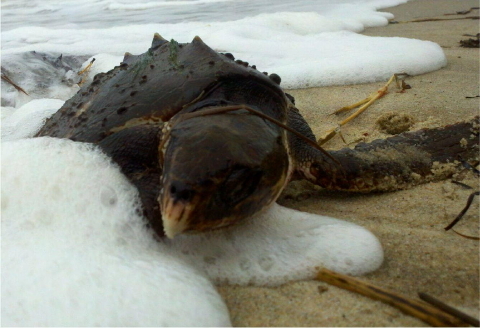 Each fall juveniles get trapped in Cape Cod Bay by cold waters, become cold-stunned and are eventually driven ashore like flotsam and jetsam in stormy conditions. If we can rescue them from beaches before hypothermia finishes them off, these critcally endangered turtles can be rehabilitated and returned to the wild to restore diminished populations. At each high tide in the very worst of weather conditions, rescuers scour beaches facing the prevailing winds in search of stranded turtles. 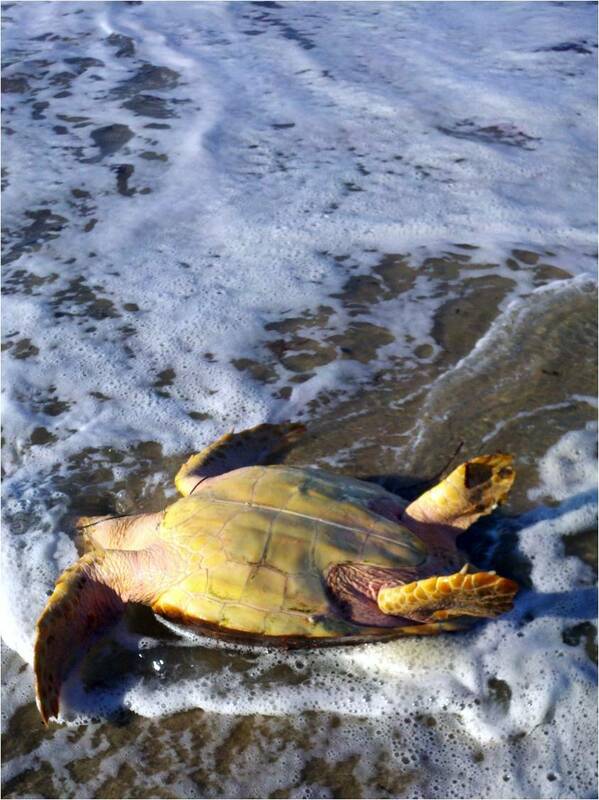 For this lucky Kemp’s ridley, Sue and Rufus were at the right spot at the right time, just as it hit the shore. So, this turtle’s chances for survival are very good. And in the case of critcally endangered species like the Kemp’s ridley, saving one juvenile at a time really means saving their whole world. Frigid conditions and a brisk westerly wind signaled a perfect morning for sea turtle patrol on Outer Cape Cod. 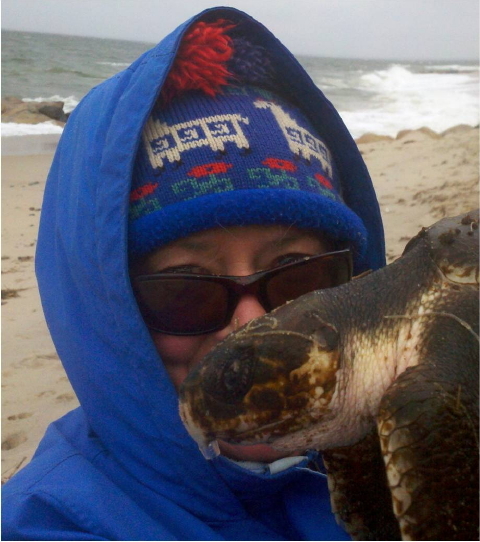 With a west breeze, Sue Wieber Nourse and Rufus the Turtle Dog headed for the long, westerly facing Cape Cod Bay beaches of Truro to check for cold-stunned sea turtles. 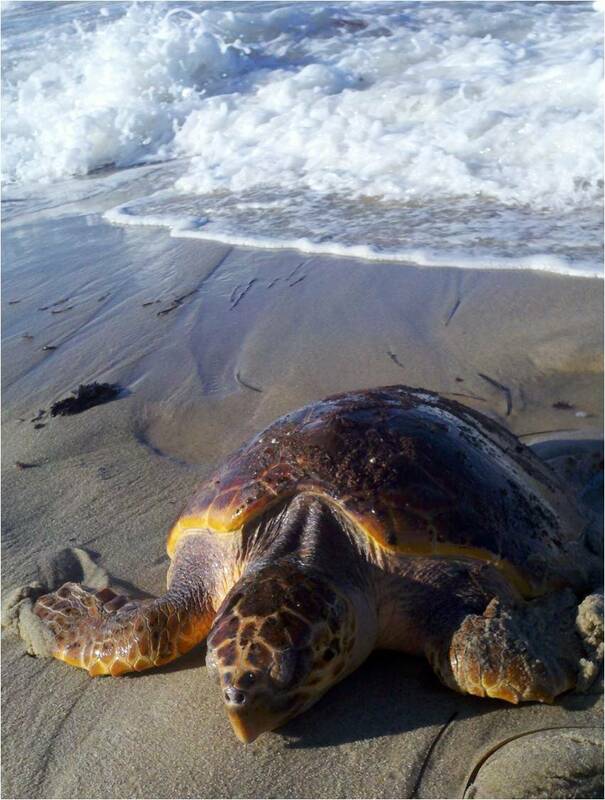 Half a mile south of Ryder Beach landing, they rescued a large, 60-pound loggerhead stranded in conditions unfit and unsafe for any self-respecting, semi-tropical sea turtle. Wind and surf tossed the turtle upside down, pinning it in a dangerous and life-threatening position. Its head was submerged, taking on water and sand as each breaker crashed. Undaunted by brutal conditions, Sue and Rufus charged into the icy water and pulled 60 pounds of slippery, “dead” weight to the shore and safety. Once on land, the loggerhead exhibited signs of life. Sue examined the sea turtle, documenting a lively community of epibiota clinging to its massive carapace. 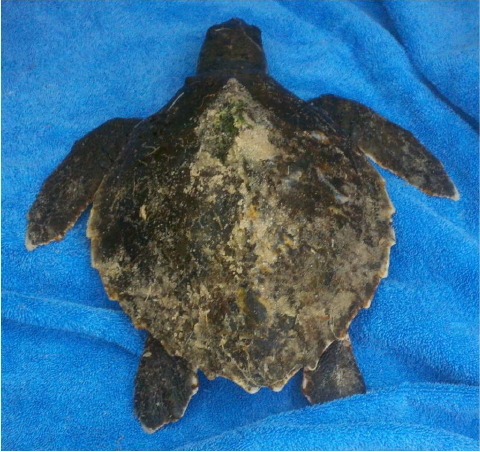 She assessed this loggerhead in relatively good condition, considering the trying circumstances. In accordance with rescue protocol for cold-stunned sea turtles, Turtle Journal notified Mass Audubon’s Wellfleet Bay Wildlife Sanctuary at 508-349-2615 and Bob Prescott, the director, drove to Truro to meet up with Sue and Rufus and to retrieve the hefty loggerhead. 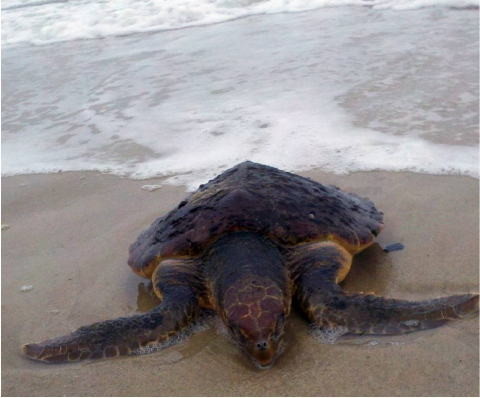 The turtle is now destined for the New England Aquarium for treatment and rehabilitation. You are currently browsing the Turtle Journal blog archives for November, 2012.